Thorney FC with their Peterborough Premier Division runners-up medals. The secret behind Thorney FC’s rise up the Peterborough Premier Division is out - they don’t bother training! Thorney confirmed a second-placed finish with a 4-3 win over Leverington last weekend. In the last three seasons the homeless villagers - they stage their home games in Gunthorpe at Campbell Drive - have finished third from bottom, fifth and now second. They’ve registered best-ever finishes two seasons in a row. It’s a staggering record for a team who lack the facilities and support of most clubs at the same level. “We have no right to finish above some the clubs in the Premier Division.” Thorney manager Tom Florence stated. “We run one team and an under 18 team and we haven’t trained once this season, basically because of financial constraints. “But we still manage to attract some good quality players and hopefully most of them will still be around next season. I’d love to say we can go one better, but next season is threatening to be the most competitive Premier Division for years. “I’m so proud of what we’ve done this season though. My only regret is we haven’t won a trophy. 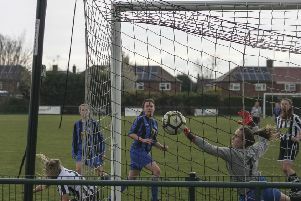 Peterborough Sports Development have finished third and Stamford Lions will finish fourth if they win at Langtoft United on Saturday (April 20). Premier Division: Langtoft United v Stamford Lions, Thorney v Whittlesey Athletic.